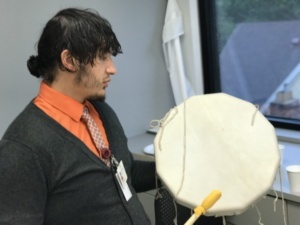 Native Drumming at Indian Health Board | Drum Teachings for SuccessIndian Health Board of Minneapolis, Inc.
Our clinic includes the hand drum because we know this practice provides direct and indirect healing benefits. The protective factors the hand drum promotes are wellness and prevention. 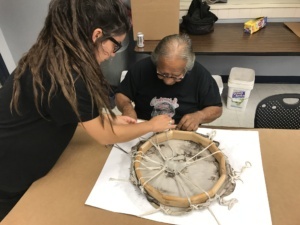 Together, the youth up to age 24 make traditional drums, hand drum, and sing to maintain balance. Our classes and groups run quarterly. To learn how to participate, call Michael Norcross for an initial intake appointment at 612-721-9809. Drum Teachings for Success is an initiative the promotes the use and development of evidence-based and practice-based models. These culturally-appropriate prevention and treatment approaches allow our practitioners to implement and integrate traditional healing and behavioral wellness models in our community. Our program is funded by an Indian Health Service grant that helps our clinic promote early intervention strategies and implements positive youth programming. We aim to reduce risk factors in American Indian youth up to age 24.